Abstract | Citrus reticulata Blanco (kinnow) is an important fruit crop of Pakistan playing pivotal role in its export economy. Due to various pathogens the quality of fruit gets diminished. One of such problem includes the occurrence of various skin disorders which leads to the rejection of fruit in international market. This study was designed in order to identify the pathogens that ruin the peal of Citrus reticulata Blanco (kinnow) in order to improve its quality. About twenty six sampled fruits of Citrus reticulata having damaged skin were obtained from the orchards of Sargodha. The samples were classified into groups on the basis of physical appearance of lesions on peal and the disease severity was then identified. Both classical and molecular method was used for identification of pathogens. Under classical approach the infected sections from the skin of kinnow was utilized to grow fungal colonies on generalized media, i.e. potato dextrose agar, from which six fungal colonies were also isolated and studied further. Under molecular approach direct DNA was isolated from the infected skin of sampled fruits by using CTAB method. The pathogens being identified through classical approach includes: Penicillium sp., Aspergillus flavus, Aspergillus niger, Alternaria sp., Lasiodiplodia theobromae, Fusarium sp. After sequencing of DNA the pathogen species identified includes fungal Colletotrichum sp. These pathogens are involved in deterioration the skin of Citrus reticulate. They can either attack the healthy fruit leading to various infections or they can enter through various lesions caused by physical stress and worsen the condition. Citation | Fatima, S. and S. Iram. 2019. Identification of fungal pathotypes associated with skin disorders of Citrus reticulata Blanco through classical and molecular approach. 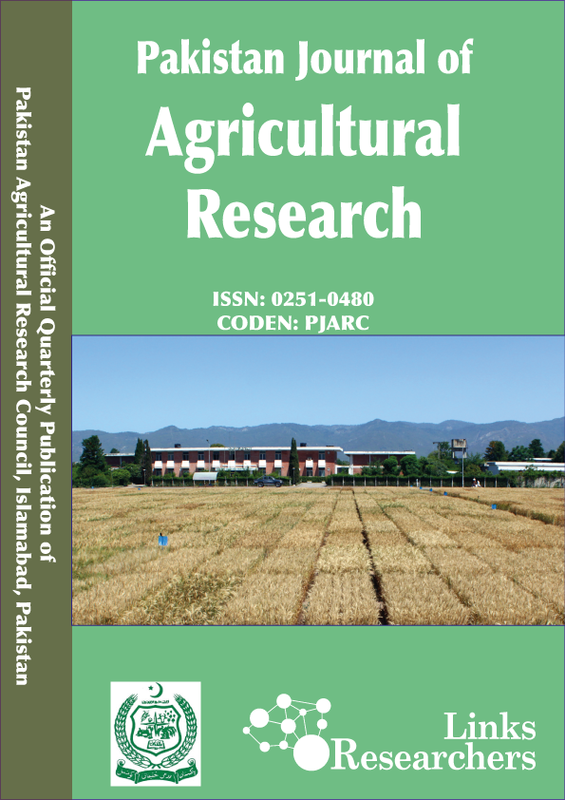 Pakistan Journal of Agricultural Research, 32(1): 95-101. Keywords | Citrus, peel disorders, fungal pathogens, direct DNA isolation, Colletotrichum sp. Citrus reticulate Blanco (kinnow) is an important fruit crop not only in Pakistan but around the world. In Pakistan about 199,000 hectares of agricultural land accounts for citrus cultivation giving it a prestige position in the economy of country (Aatif et al., 2015). Pakistan falls on the sixth position in production of kinnow and oranges throughout the world with 1.70 million tons of annual production (Tahir, 2014). Citrus peel disorders are categorized as pre-harvest and postharvest disorders. Pre-harvest disorders are developed during the growth of citrus peel and are mostly caused by insects, microorganisms, climatic conditions, nutritional deficiencies, toxicities, chemical sprays etc. Most of the time they have characteristic appearance, like having a definite pattern, colour and roughness, which can provides evidence about the causing agent. Most frequently peel blemishes are instigated by insects and microbes that lead to the damage to the cuticle, epidermal and sub-epidermal cells. Pre-harvest conditions also effect the development of postharvest disorders. Other than that the handling, packing, storing and transporting conditions leads to postharvest disorders (Gene-Albrigo and Galán Saúco, 2002). There are number citrus pathogens and diseases prevailing in Pakistan. Among them the most prominent one includes citrus leaf miner which is caused by Phyllocnistis citrella and leads to great loss of citrus fruit quality. Phyllocnistis citrella (Stainton) causes the formation of silvery mines on stems, leaf and fruit surface (Atiq et al., 2013). In citrus greening leaf mottling is the most prominent symptom. The fruits in this disease become small, lopsided and dull green coloured. This disease occurs in high severity in Peshawar and Sargodha. Citrus slow decline is caused by Tylenchulus semipenetrans. In this disease the twigs starts to dry off and terminal growth decreases (Khanchouch et al., 2017). Citrus canker, cause by Xanthomonas campestris, is another problematic disease in Pakistan. In this disease round blister-like lesions are formed. Citrus wither tip, caused by Colletotrichum gloeosporioides Penz, is also a serious disease throughout the country. In this disease the symptoms starts from the top and spreads downward to bottom of tree. Other fungal diseases in Pakistan includes Septoria spot caused by Septoria sp., stem end rot caused by Phomopsis and Diploidia sp., Trunk gummosis caused by Phomopsis Diploidia, foot rot caused by Phytophthora sp., root rot caused, damping off caused by Pythium, Rhizoctonia solani and Phytophthora sp. and citrus quick decline (Khanchouch et al., 2017). As the kinnow fruits being exported are accessed under a strict eye therefore compromising the fruit quality in terms of appearance can have negative impacts on economy. So in order to compete in international market, strict standards have to be met not only in terms of nutritional value but also in terms of cosmetic value. So the purpose of this study was to identify those pathogens that contribute in causing skin disorders and diminish their worth. This can assist in adoption of environment and economic friendly methods that can be undertaken to meet the standards of international export market. The main objectives of this study include isolation of pathogen from citrus peel and characterization and identification of pathogens by classical and molecular methods. The infected samples of Citrus reticulate Blanco (kinnow) were received from the orchards or Sargodha district and brought to the Environmental Mycology and Ecotoxicology Laboratory of Department of Environmental Sciences, Fatima Jinnah Women University Rawalpindi. Pathogen isolation: Under the classical approach fungal pathogen were isolated by utilizing the infected section from the peel. Small sections of infected peel were cut down and placed on generalized media i.e. potato dextrose agar. It was then incubated at 28°C for 2 – 7 days to obtain mother cultures. Pure fungal colonies were obtaining from the mother culture by utilizing spore shooting and drop method. Pathogen identification: The fungal species were identified by observing the colour, pattern, texture and other colony characteristics as well as by studying the microscopic characteristics of spores. Direct DNA isolation: The DNA of pathogen from the citrus peels was isolated by following the CTAB protocol proposed by Krizman et al. (2006). About 0.1g of infected peel tissue was homogenized with 3ml of extraction buffer in a mortar and transferred to micro-centrifuge tubes. It was then incubate at 55 °C for 30 min. After cooling and centrifuge, about 1 volume of chloroform-isoamyl alcohol was added to the supernatant and was vortex thoroughly. It was again centrifuged and about 0.45 volume of chilled isopropanol was added to the upper aquous phase and mixed by inversion. It was then incubate at low temperature for 1 hour. After centrifuge the supernatant was discarded and wash buffer was added to wash the pallet. The centrifuge was again done and the supernatant was discarded. The pallet was then allowed to dry at room temperature and then dissolved in TE buffer. The isolated DNA was then visualized on 0.8% agrose gel. Sequence analysis: The isolated DNA samples were then sent to Macrogen Korea laboratories for amplification and sequencing. The results obtained from Macrogen Korea laboratories were first edited by using the software BioEdit Sequence Alignment Editor. The similarity of sequence was detected with the help of Basic Local Alignment Search Tool (BLAST), network service provided by National Centre for Biotechnology Information (NCBI), against NCBI GenBank databases. The phylogenetic tree was the constructed by utilizing MEGA6 software. Group A: Raised lesions resembling more like blisters. Group B: Dark brown to black coloured lesions. Group C: Dark brown coloured lesions having projections. Group D: Dark brown to grey coloured lesions spreading like a web on the fruit peel. Group F: Chalky brown to grey coloured blemishes covering almost the entire fruit. The disease severity and infection index of the samples was also measured and are presented in Table 1. Table 1: Disease severity and infection index of sample. Identification of fungal pathogen: The assessment of fungal colonies on the basis of colony characteristics (Figure 2) and microscopic characteristics of spores (Figure 3) lead to the identification of six fungal species. The fungal species being identified include Lasiodiplodia theobromae, Penicillium sp., Aspergillus flavus, Aspergillus niger, Fusarium sp. and Alternaria sp. Detailed physical and microscopic characteristics of fungal species are presented in Table 2. Table 2: Physical and microscopic characteristics of fungal species. crop. Adisa and Obinyereokwu, (1988) studied the histology of rind infection caused by Lasiodiplodia theobromae. It revealed that this fungus infects the plant at an early stage but does not show any symptoms until the fruit becomes fully ripened. The histology of infected peel showed tightly packed epidermis, flavedo and albedo cells having decolouration in their chloroplast which then leads to brownish to dark brown lesions with varied sizes. Zhao (2015) reported Lasiodiplodia in causing citrus stem end rot. Aspergillus niger and Penicillium digitatum, commonly called as black and green or blue mold respectively, are the most reported fungus causing post-harvest deterioration of peel. Liaquat et al. (2016); Eckert and Brown (1986); Singh et al. (2012) has reported them infecting physically damaged peel leading to formation of dark brown blemishes. Fusarium is a soil borne pathogen found to be present in almost all citrus fields (Rehman et al., 2012). Yaseen et al. (2012) has reported it in causing dry rot and root rot. A study conducted by Ezeibekwe and Unamba (2008) also showed high incidence and severity of citrus fruit rot caused by F. oxysporium and F. equiseti. Alternaria has been reported by Timmer et al. (2003) and Peever et al. (2004) for causing citrus black rot by attacking the fruit through cracks in the rind leading to formation of black spots or blemishes on the peel. The molecular approach implies the identification of pathogen on the basis of its DNA sequence. It is more accurate and reliable approach. After visualizing the isolated DNA samples on 0.8% agrose gel, the samples showing strong visible bands were entitled as Sd2, Sd3 and Sd4. The sequenced data, being received from Macrogen Korea laboratories after PCR amplification and sequencing, was then manually processed with the help of BioEdit Sequence Alignment Editor in order to remove background noise. The sequence was then submitted to DDBJ and the accession numbers thus obtained are mentioned in Table 3. The similarity index was then computed against NCBI GenBank databases. The evolutionary analysis between isolated sample and species showing high similarity was then conducted with the help of MEGA6 software. The dendograms showing phylogenetic relationship between the isolates Sd2, Sd3 and Sd4 and other related published data being generated are shown in Figure 4, 5 and 6 respectively. Table 3: Accession no. of isolates as allocated by DDBJ. Sd2 LC209169 18S rRNA, ITS1, 5.8S rRNA, ITS2 and 28S rRNA 9F(5&apos;-AGTTTGATCCTGGCTCAG-3&apos;), 1510R (5&apos;- GGCTACCTTGTTACGA-3&apos;) Colletotrichum sp. Sd3 LC209170 18S rRNA, ITS1, 5.8S rRNA, ITS2 and 28S rRNA 9F(5&apos;-AGTTTGATCCTGGCTCAG-3&apos;), 1510R (5&apos;- GGCTACCTTGTTACGA-3&apos;) Colletotrichum sp. Sd4 LC209171 18S rRNA, ITS1, 5.8S rRNA, ITS2 and 28S rRNA 9F(5&apos;-AGTTTGATCCTGGCTCAG-3&apos;), 1510R (5&apos;- GGCTACCTTGTTACGA-3&apos;) Colletotrichum sp. The fungal pathogen identified under molecular approach belonged to Colletotrichum sp. Colletotrichum is one of the most important pre-harvest plant pathogen (Deen et al., 2012). Genetically C. siamense, C. queenslandicum, C. musae, C. alatae, C. aotearoa, C. horii, are placed under ‘Colletotrichum gloeosporioides species complex’ (Weir et al., 2012). Sharma et al. (2015); Rhaiem et al. (2016) identified Colletotrichum gloeosporioides as the main cause of anthracnose lesions on leaves and fruit of citrus. According to their study it causes brown to black streaks (tear stain) on mature fruit. Chung et al. (2002); Marques et al. (2012); McGovern et al. (2012); Lima et al. (2011) also reported the involvement of Colletotrichum gloeosporioides and Colletotrichum acutatum in causing post bloom fruit drop. In this disease necrotic yellow brown lesions are formed on leaves leading to abscission. Glomerella cingulata has been identified to cause anthracnose of Citrus reticulata (Koh et al., 1997). Douanla-Meli et al. (2013) reported Colletotrichum gloeosporioides being isolated most frequently from the infected samples of Citrus limon accounting for 50.4 % of all isolates. A study conducted by Mascarin et al. (2016) reported that Colletotrichum nymphaeae is an insect pathogenic fungus and its prevalence is highly dependent on the occurrence of insects and other environmental factors. It is essential to study more comprehensively the pattern and mode of infection of these pathogens. This will help in more effective management of these pathogens in order to retain the export quality of Citrus reticulata Blanco. On the basis of this study it is concluded that there are several pathogens that are involves in deteriorating the quality and causing skin disorders of Citrus raticulata Blanco (Kinnow). Under classical approach the fungal pathogens identified included: Penicillium sp., Aspergillus flavus, Aspergillus niger, Alternaria sp., Lasiodiplodia theobromae, Fusarium sp. These fungal pathogens attack the citrus fruits and produce both pre-harvest and post-harvest problems. As classical methods are not the absolute method therefore direct DNA isolation was adopted as a molecular approach. After sequencing the isolated DNA and processing the information, the pathogens that were identified included several species of Colletotrichum. Colletotrichum is the most important pathogens notorious for causing pre-harvest citrus diseases. The pathogens were also being isolated from lesions that seemed like the consequence of physical stress. So it is concluded that different fungal pathogens can attack and invade the citrus peel either directly or through already present lesions. They can produce immediate impact or the fruit may seem healthy at the time of infection and symptoms appear at a later stage. The identification of these fungal pathogens can facilitate in devising a better management plan for the prevention of various skin disorders of citrus fruits and for maintaining their economic value. Shazia Iram conceived the idea and supervised the study. The experiments were performed and put together by Saman Fatima. Aatif, M., Z. Hassan, S. Ahmed. 2015. Pakistan’s Citrus Industry (An Overview of Key Constraints). The Patriot. (2015, April 10). Atiq, M., M.A. Khan, S.T. Sahi and R. Ahmad. 2013. Genetic response of citrus germplasm against citrus leaf miner. J. Anim. Plant Sci. 23(1): 240-243. Eckert, J.W. and G.E. Brown. 1986. Postharvest citrus diseases and their control. Fresh citrus fruits, 315-360. Ezeibekwe, I.O. and C.I.N. Unamba. 2008. Pathogens Associated with Cutrus Fruit Rots in Imo State of Nigeria. Bot. Res. J. 1(4): 89-92. Khanchouch, K., A. Pane, A. Chriki and S.O. Cacciola. 2017. Major and Emerging Fungal Diseases of Citrus in the Mediterranean Region. In Citrus Pathol. InTech. Koh, Y.J., J.H. Song, M.Y. Ahn, D.K. Moon, H.R. Han, H.M. Kwon and D.Y. Moon. 1997. Morphological and Cultural Characteristics of Glomerella cingulata Causing Anthracnose of Citrus. Korean J. Mycol. 25(1): 30-34. Križman, M., J. Jakše, D. Baričevič, B. Javornik and M.Prošek. 2006. Robust CTAB-activated charcoal protocol for plant DNA extraction. Acta Agric. Slovenica. 87(2): 427-433. Sahi, S.T., M.U. Ghazanfar, M. Afzal, A. Rashed and A. Habib. 2007. Incidence of citrus canker disease caused by Xanthomonas campestris pv. citri (Hasse) dows on Kinnow (Citrus reticulata) and its chemotherapy. Pak. J. Bot. 39(4): 1319. Singh, H., G. Al-samarai and M. Syarhabil. 2012. Exploitation of natural products as an alternative strategy to control postharvest fungal rotting of citrus. Int. J. Sci. Res. Publ. 2(3): 1-4. Timmer, L.W., T.L. Peever, Z.V.I. Solel and K. Akimitsu. 2003. Alternaria diseases of citrus–Novel pathosystems. Phytopathol. Mediterr. 42(2): 99-112.